Guinea Fowl Lodge, sleeps 12 people, perched high on the mountain side, has stunning views of the golf course, dam, the quaint town of Clarens, rolling hills and the distant Maluti Mountains. It`s open plan design, tasteful décor, large patio and deck area as well as a `Bosberaad` table provide an ideal setting for private and corporate groups. six bedrooms, configurable in twin or king size beds, sleeping up to 12 people sharing. Large patio and braai area. Bedrooms and living areas have under-floor heating. All bedrooms have their own colour scheme, built-in cupboards and hair dryers. One or two connected groups of people. Golfers (can accommodate 3 four balls sharing. The par 71 golf course, designed and constructed by Golf Data, is bound to excite every level of golfer. All 18 holes meander along and across the tranquil river and its splendid series of dams and cascading waterfalls. The village of Clarens offers an abundance of restaurants, coffee shops, art galleries and interesting shops for the browser. For those who enjoy more physical activities one is spoiled for choice - white water rafting, clay pigeon shooting, paint ball shooting, mountain bike and 4x4 trails, hiking, fly fishing, horse riding, golf and quad biking. 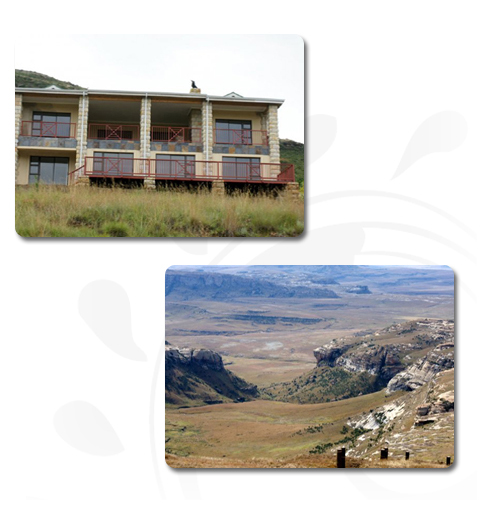 There are also a number of interesting historical and fossil sites in the Clarens vicinity. For those who need a bit of pampering there are also spa facilities within a few kilometres of Clarens. Annual events include: The Cherry Festival, The Clarens Craft Beer Festival, The Clarens Festival, Surrender Hill Marathon, and many more. How many Children aged 3 and over but under 12 years old (half price)?